↑ Nicholas Carlson (April 24, 2014). ↑ "Gmail Now Has 425 Million Users, Google Apps Used By 5 Million Businesses And 66 Of The Top 100 Universities". ↑ "60 Amazing Google Search Statistics and Facts". ↑ "Google Search Statistics". internetlivestats.com. ↑ Amanda Beck; Gary Hill (November 13, 2007). "Google founder Larry Page to marry". Reuters. Retrieved May 15, 2013. ↑ Ryan Tate (November 6, 2009). "Another Google Heir Is Born". Business Insider. Business Insider, Inc. Retrieved May 15, 2013. 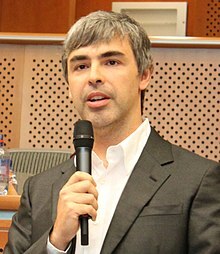 ↑ "Larry Page Fast Facts". cnn.com. Retrieved June 23, 2013.